Are the kids bored and tired of video games, swimming, and just hanging out? Looking for something different to do with them on a Friday night? How about something different and FREE? 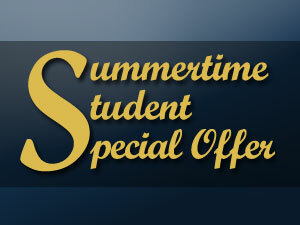 Then here’s a cool student BOGO offer for both you and the kids. For every regularly priced ticket to AMT’s critically acclaimed Broadway: Now & Forever that you buy for Friday, July 26, you’ll receive an additional student ticket, FREE! There’s fun music, singing, and dancing from 17 of the best Broadway shows, and a dozen local kids are featured in numbers like Billy Elliot, Mary Poppins, Annie, and Les Miserables. You don’t have to travel for hours to New York City to be transported to Broadway … it can be experienced with all the excitement, music, costumes, and sets, just like Broadway, but conveniently located right here in Lancaster, PA. Just think, with the short travel time, “are we there yet” may not even be muttered! Here’s your chance to do something totally awesome with the kids this summer – come enjoy a great show AND save a little cash for yourself. With the money you save on their free tickets, you can all go out for pizza before the show. To get your free student tickets, stop by our Box Office, call us at 800-648-4102, or purchase tickets online at AMTshows.com. Make sure to use code STU13 when ordering. Looking forward to seeing you and the kids on July 26! One free student ticket with the purchase of one regularly priced adult ticket for Friday, July 26, 2013 show only; Valid for up to six adult tickets. New orders only; Based on availability. Cannot be combined with other offers; Service fees apply; Must mention code STU13 at time of purchase.